When I came a crossed this prompt from Kathy the Scrapbook Lady, I just had to write a blog post about it. I am totally up for the challenged. The challenged is to take an old photo and journal about it like it was taken today. Don't worry that you don't have all the details written down! Search your memory and do the best you can to fill in the details. I saw this photo of me and my parents in my old album. 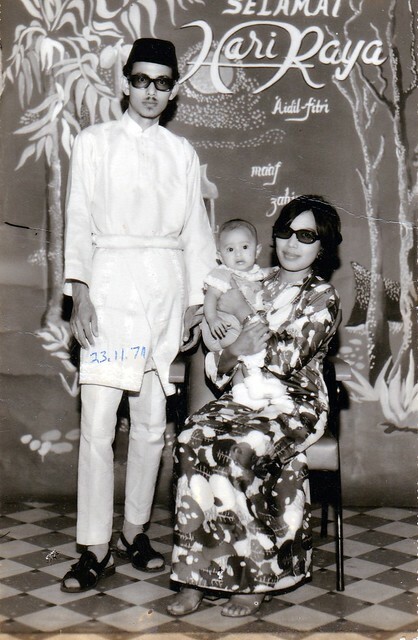 It was taken on 23 November 1971 during Eid, it was my first Eid. I think I was five months old at the time. Being a young parents with a new baby girl was so exciting. I probably changed their world upside down. I am so glad that they took the time to do to a photo studio and captured this moment in time. Now forty two years later,that baby girl , who has grown up , can take a glimpse at what her life looked like back in 70’s. I just realized that I am like my mother, we love to take photos and scrapbook about them. If not for a little scribbled she wrote at the back of the photo, I would not have known that this was my first Eid. When my daughter saw this photo, she thought that the young lady in the photo was me. I told her that I was the baby and the young couple were their grandparents. I knew that I just had to scan this, print them on A4 paper and hang them up. It’s such a treasure for me.